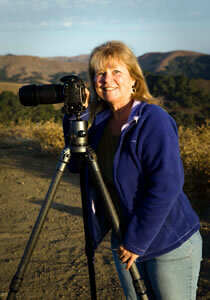 Beth Huning has been interested in photography, nature and conservation, and other cultures her entire life. Through her extensive world travels and environmental conservation work, she has amassed a large inventory of images ranging from exotic places such as the high artic and Papua New Guinea to more local conservation efforts such as documenting the restoration of wetlands in and around San Francisco Bay. Beth has shared her enthusiasm for nature, photography, and environmental conservation through lectures and leading natural history tours, teaching photographic workshops both locally in the San Francisco Bay Area as well as to locations around the world. Her images have been primarily printed in large format for gallery sales. They have also been published for editorial purposes in brochures and conservation publications as well as magazines as Bay Nature and books such as The Bird Garden, and the Brooklyn Botanic Garden series where she also co-authored several books on gardening for wildlife. Beth has been a devoted conservationist, having worked for the National Audubon Society and National Park Service in Yosemite. She currently coordinates the San Francisco Bay Joint Venture, a public-private partnership implementing the federal bird conservation plans to protect and restore wetlands in San Francisco Bay and along the California coast. Her photography work is utilized to document changes in habitat as a result of restoration projects. Beth is an active member, former Membership Chair, and on the Environment Committee of the North American Nature Photography Association. Beth hopes that her images will lead others to appreciate and conserve the natural environment and protect the rich heritage of other cultures.